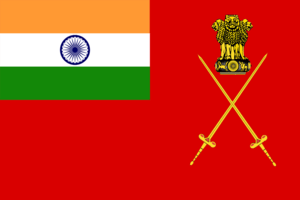 The Flag of Indian Army – The Story about the career of an Indian Army Officer. Lieutenant General V V S Pratap Rao, The Director General of Armed Forces Medical Services, Indian Army during 1982-83 lied about his actions and the Testimonials reveal that Story. TESTIMONIALS REVEAL A STORY :Mr. Todd Embers, a native of Andhra Pradesh, India, who has described himself as an Anglo-Indian, apparently a relative of Lieutenant General V V S Pratap Rao who had served as the Director General of Armed Forces Medical Services of Indian Army has commented that my statements about General Rao are completely erroneous. He has further observed that I am making my statements with a malicious intent to malign the reputation of General Rao. He had concluded that I have the problem called ‘ego’, and that I am self-centered. Kindly read his comments at my Homepage.https://bhavanajagat.com/aboutI fully agree with Mr. Todd Embers that this perception that views me as a person of ‘ego’ has contributed in a very significant manner and may have contributed to the hostility and animosity displayed by General Rao in his official conduct as the Director General of Armed Forces Medical Services. I would like to submit to my readers that I had joined Indian Army while I was a student at Kurnool Medical College, Kurnool with a simple desire to serve the Nation and to defend its territorial integrity. Over the last 25 years, I have gone through a rigorous self-examination leading a life of utter simplicity and humility and have not discovered the problem called ‘ego’. I speak about the actions of General Rao as he has misused and abused his power to undermine my ability to serve in Indian Army with a sense of Pride and Honor. He had an equal duty, and responsibility to serve the cause of the Nation and he had failed in the discharge of his duties. I have come to this opinion based upon my objective analysis of his actions. I never had any subjective experience of his behavior or conduct and I do not really know him as a person. His actions which were basically unethical and which constitute illegal harassment of a junior Medical Officer are as follows:1. He had illegally interfered and contacted a Defence Service Civilian Staff Officer at Medical Directorate(DMS/Army) to post me as a Medical Officer to a Medical Battalion in AIZAWL, Mizoram State, India during 1982.2. 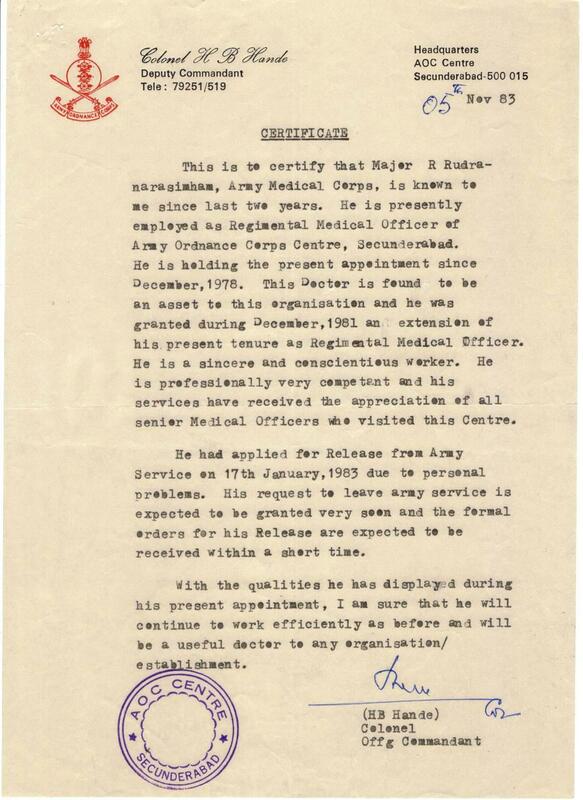 When the above posting order was duly challenged, General Rao spoke to Lieutenant General Banerjee, the Director of Medical Services(Army) and had instructed him to post me to a different establishment at AIZAWL, Mizoram State, India without allowing the DMS(Army) to exercise his discretionary powers while posting Medical Officers to their assigned posts. General Rao, the DGAFMS has no direct jurisdiction over matters that pertain to postings of Medical Officers and the Office of the DGAFMS is only involved in matters that pertain to training and the training policy in respect of AMC Officers.3. 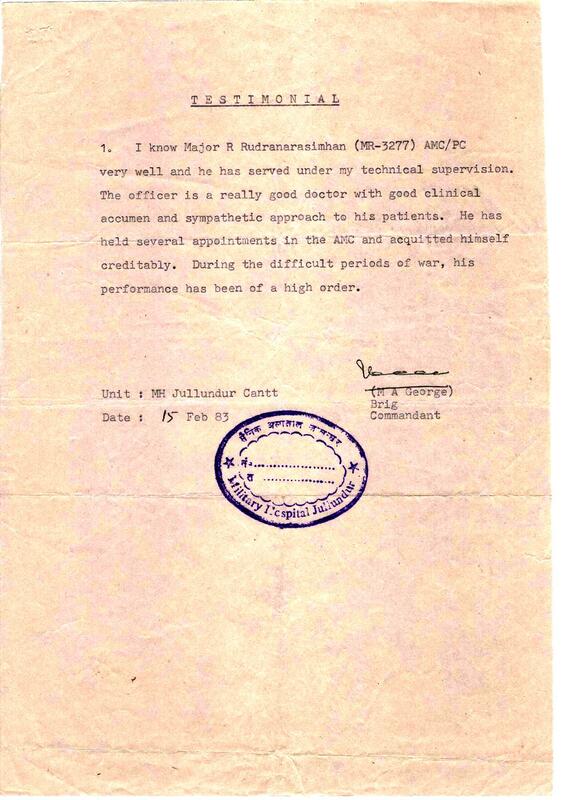 When I had applied to resign my Permanent Regular Commission in Army Medical Corps, General Rao had repeatedly told lies to Lieutenant Colonel S B Ghosh AMC, Radiologist, Military Hospital, Secunderabad who had directly asked him to verify his decision in the matter of my resignation application. Based upon the false assurance given by General Rao that my letter of resignation was recommended, I had contacted several Senior Officers and had obtained testimonials from them. The photo images of those testimonials are shared in this blog post.4. In the remarks he had written and forwarded to the Union Minister of State for Defence, General Rao had failed to provide information to the Government of India that would best serve the interests of the Nation. I had obtained a personal interview with Shri. Kamakhya Prasad Singh Deo, the Union Minister of State for Defence at his office in South Block on September 18, 1983. The Minister was not briefed about my meritorious service during 1971 War and was not informed that I was the recipient of the DGAFMS Medal in 1976. The Minister spoke to me and at the end of the interview granted my request to resign my Permanent Regular Commission as the DGAFMS had not supported his own recommendation to reject my request with objective evidence about my performance as an Officer in Army Medical Corps.5. 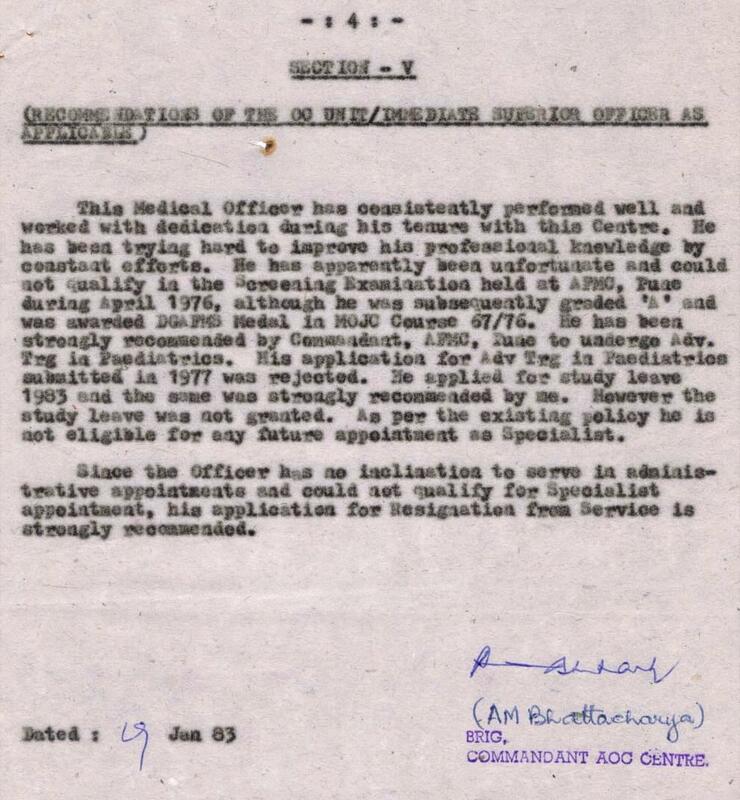 Prior to my personal interview with the Union Minister of State for Defence, Government of India during August 1983, had asked the DGAFMS to review the AMC Training Policy and had specifically directed the DGAFMS to provide opportunities like Study Leave, and to undergo Advanced Specialist Training to Medical Officers who have completed ten years of Service. The DGAFMS did not disclose this decision made by Government of India to the Director of Medical Services(Army) and other Units of Indian Army, and to Medical Officers like me who had actively opposed the AMC Training Policy that placed restrictions upon opportunities that were available to Medical Officers who had completed ten years of service.6. 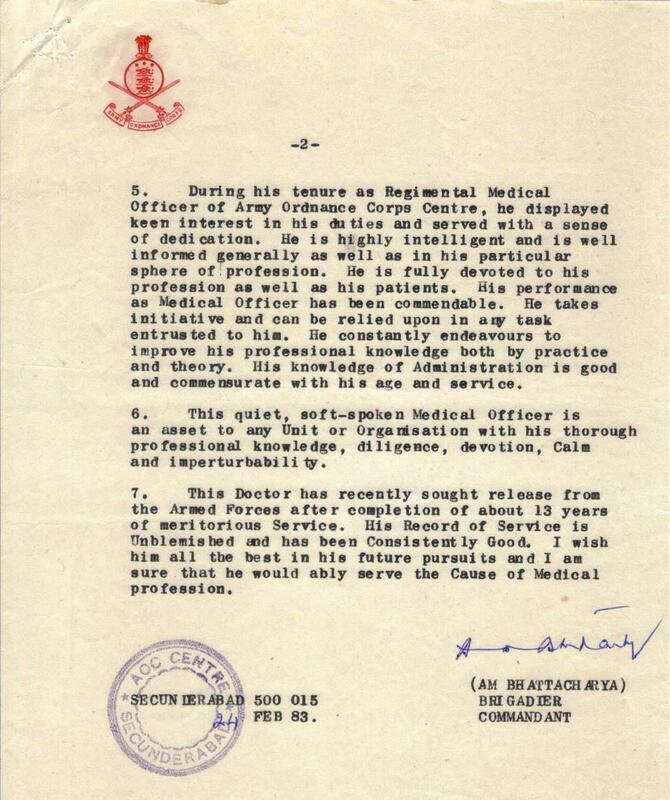 The evidence to support my statements about the actions and conduct of General Rao are available in our official documents and correspondence that is archived at Medical Personnel Records Section(Officers), Office of the DGAFMS, Ministry of Defence, New Delhi – 110 011. 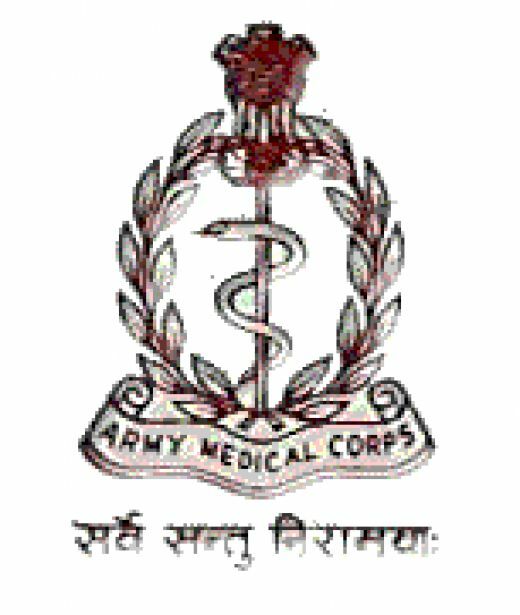 The Symbol of Indian Army Medical Corps – The Director General of Armed Forces Medical Services formulates the Army Medical Corps Policy about the grant of study Leave and the Selection of Medical Officers for Specialist Training.During 1982, Lieutenant General VVS Pratap Rao had instituted a new AMC Training Policy that prohibited Medical Officers from applying for Study Leave and to seek Specialist Training if they had completed ten years of Service. Because of this new AMC Policy, my application for Study Leave during 1982 was rejected and I was also not allowed to apply for Advanced Specialist Training. I had waged a Battle to change this Policy. I won this Battle but there was no Victory Parade. General VVS Pratap Rao kept my victory as a secret until I left Service. Major Darshan Singh forwarded my application of Resignation through Staff Channels and sent an advance copy of the same to the Director of Medical Services. 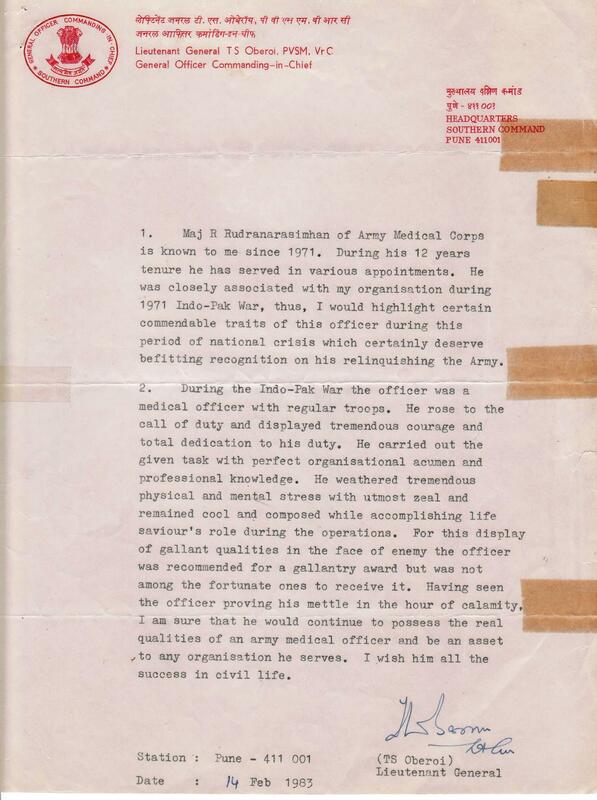 Brigadier AM Bhattacharya strongly recommended my Letter of Resignation from Service. This letter from Lieutenant Colonel D D Singh came as a Big Surprise. 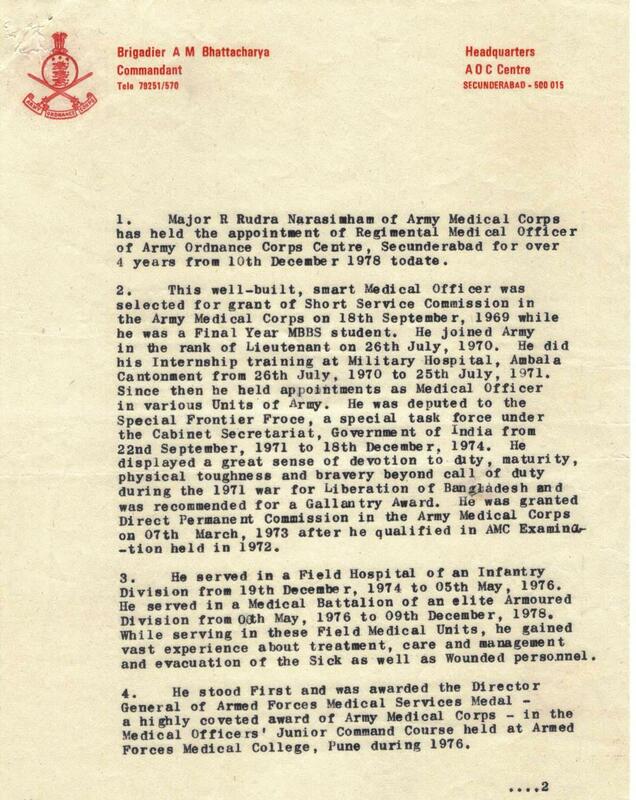 Major Darshan Singh, Adjutant AOC Centre sent a tough message to Medical Directorate, Army Headquarters on 21 February 1983. 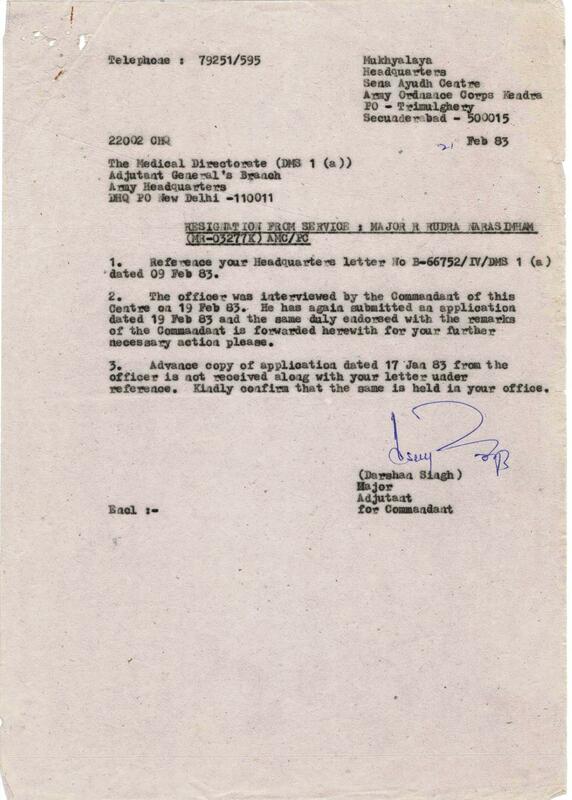 Brigadier Bhattacharya had insisted that the Letter of Resignation must be decided by the competent authority. My personal interview with Shri. Kamakhya Prasad Singh Deo, Union Minister of State for Defence took place on September 18, 1983 in his office at Ministry of Defence, New Delhi. The Minister’s younger brother was serving as Adjutant at 125 Infantry Battalion ( TA ) in Secunderabad. 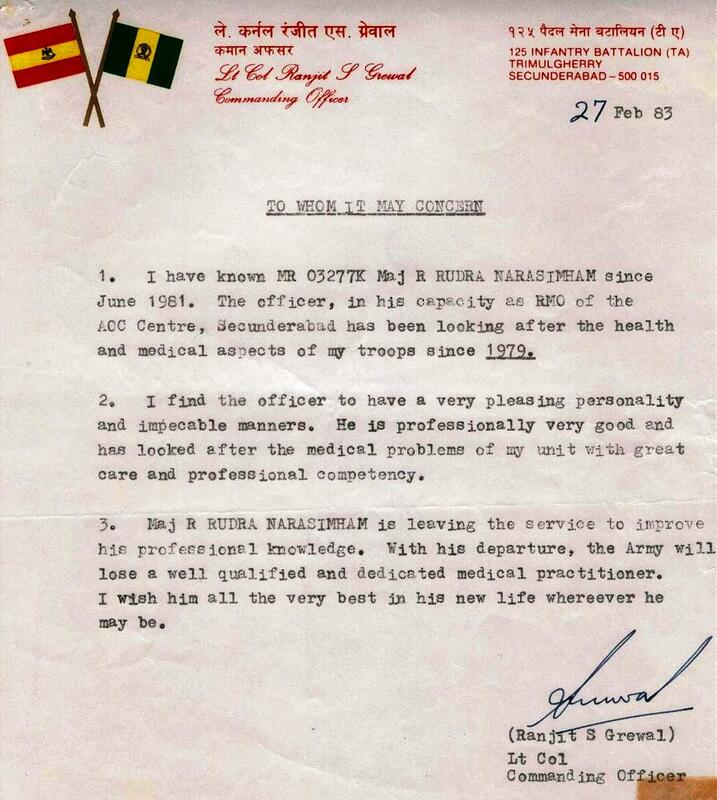 This letter was issued to me by Lt Col Ranjit S Grewal, Commanding Officer, 125 Infantry Battalion ( TA ) on February 27, 1983 several months before my personal interview with the Defence Minister. Remarks of Lieutenant General T S Oberoi, PVSM, VrC, General Officer Commanding-in-Chief,Headquarters Southern Command Pune 411001.He had remarked about my participation in the Indo-Pak War of 1971. He had not mentioned the name of the Organization(Special Frontier Force-Establishment No. 22 in which we had served to participate in the military action named Operation Eagle). 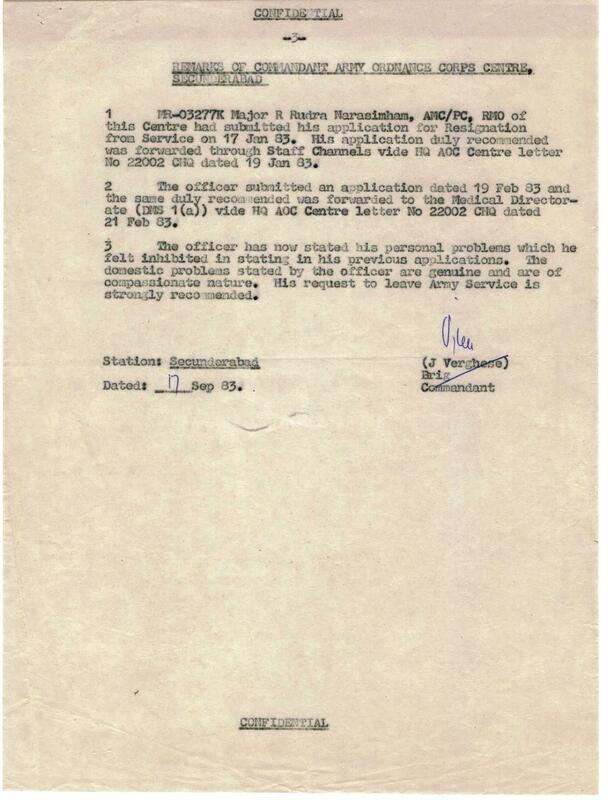 Under instructions from the Director of Medical Services(ARMY), I had prepared a second application at Central Ordnance Depot, Delhi and took it to South Block and Brigadier J Verghese signed it while standing over the front steps of the Secretariat Building. There is no AOC Centre Office Stamp under his signature. Myself and Commandant Brigadier Verghese were not present in Secunderabad on 17 September, 1983. 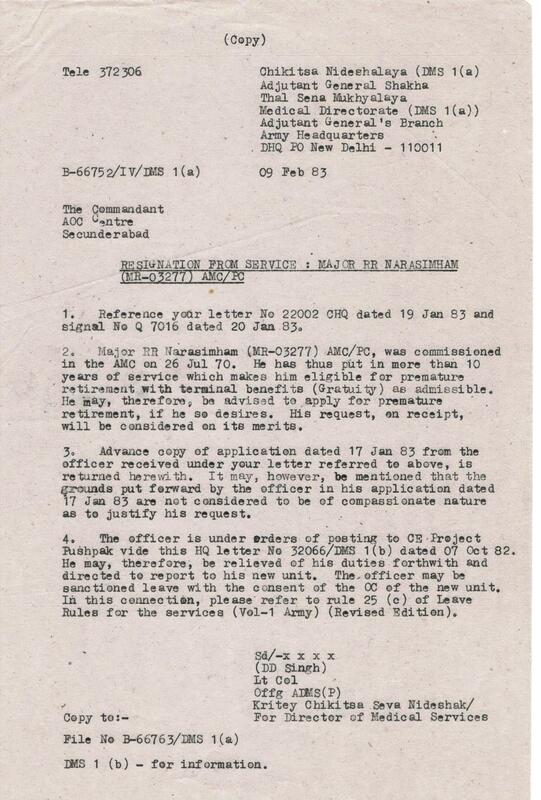 After he had signed, the application was directly delivered to the Office of DMS(Army). The Medical Services Director knew that I was present in New Delhi and that the Defence Minister had already granted me a personal interview to privately discuss my application to resign my Permanent Regular Commission. I met Union Minister of State for Defence in New Delhi on 18 September 1983 and got my Letter of Resignation approved. However, he had kept that file in his office until General Pratap Rao had retired from Service. General Pratap Rao had retired and left for Muscat, Sultanate of Oman and he was confident that Government of India would not agree to my request to relinquish my Permanent Commission. General Rao was in fact surprised to find me in Muscat, Oman when my friend went to his residence to meet him. 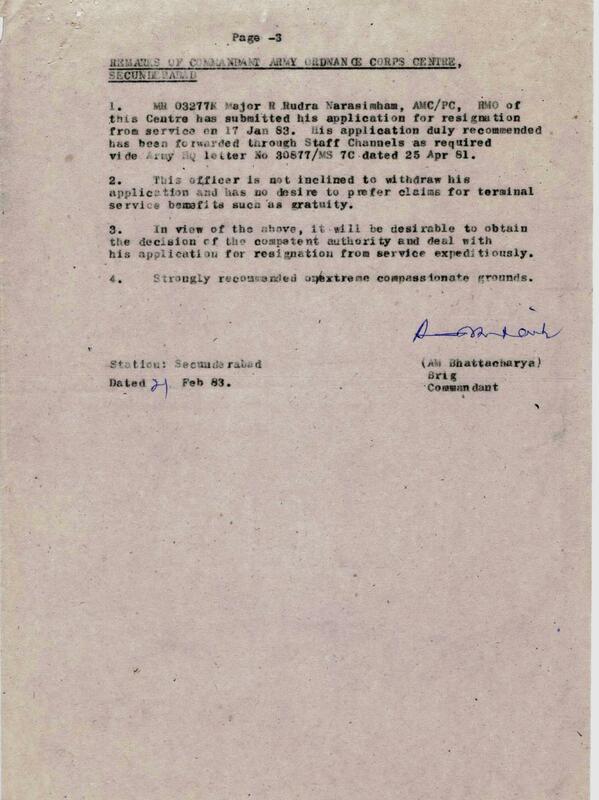 General Rao told my friend that Government of India should have rejected my letter of resignation. It amazes me that General Rao had lied about his actions in this matter of my resignation from Service. He was the Top Boss of Armed Forces Medical Services and I would expect that the General should have Courage and if he was truly convinced with his decision, he should be truthful in all of his actions and utterances. 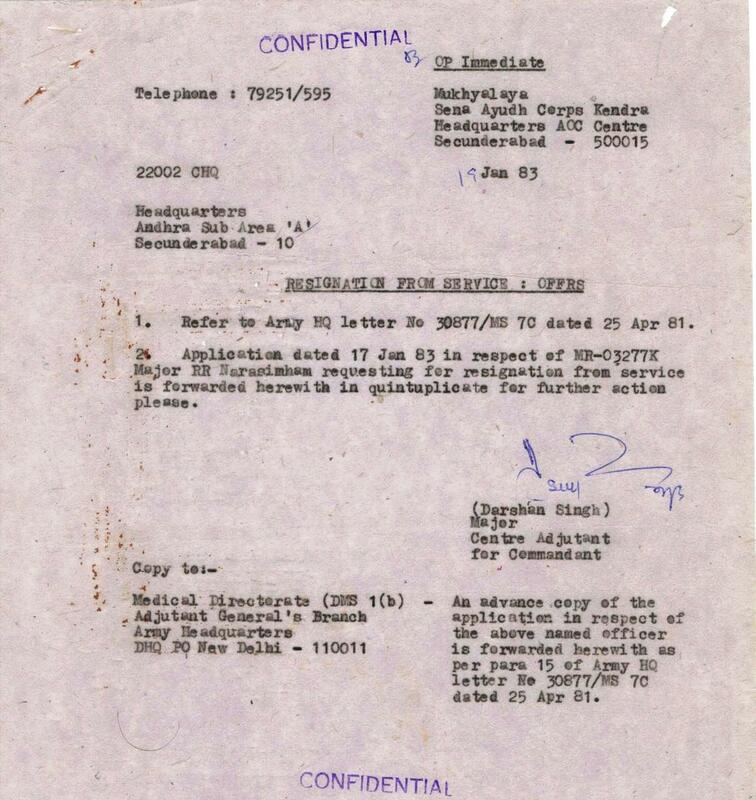 Colonel H B Hande, Officiating Commandant AOC Centre, Secunderabad in his Testimonial dated November 05 1983 made it abundantly clear that my transfer orders were never implemented and that I am waiting to leave Army Service and the orders from the Government were expected. The Minister had wanted that Lieutenant General VVS Pratap Rao, Director General of Armed Forces Medical Services should not be told about my Resignation from Service. All Senior officers and Ministers who had supported my request were concerned about the diabolical role played by the DGAFMS. A person by name Bhattacharya had recommended my Letter of Resignation. Another person by name Bhattacharya sent me this letter that my Resignation was accepted. This communication was dated 10th January 1984, my Birth Day. Army Ordnance Corps Centre, Trimulgherry, Secunderabad, A.P., India. Namaste. I’m R.K. Rao’s wife’s sister. You do not know me & neither do I know you personally.Some how I happened to be in your mailing list and receive all your blog posts and read them with interest. So far I have not commented on any of your blog writings, but now if you permit, I wish to say something to you. From all the blog posts you have written I can see that you are a very spiritually inclined person. In that case it is time to practice some of that spirituality in your life by learning to forgive and let by gones be bygones. Ofcourse, I’m nobody to advice you in such matters. You are much senior to me in age, education and experience. But this is my personal view. I believe that you will experience immense peace and joy when you forgive such people and move forward in life. I’m associated deeply with the onenenss movement. I urge you to visit the website http://www.onenessuniversity.org and http://www.onenessindia.org to learn more about the movement. Thanks for visiting my post and sharing your sincere views. I truly appreciate what you have said. The concept of “FORGIVENESS” is not expressed in Indian Tradition and Culture. I need to know this word “FORGIVENESS” in Indian Language. Any event in my life’s journey is not past while I am still alive. To understand life, we must know the whole life and entire life. There is no past, no present, and no future if the individual is an eternal entity. I read about Rama’s Life Journey. I cannot resist the tears that flow from my eyes when I read Ayodhya Kanda. Is that a past event about which I should have no rational concern? Which part of Ramayana I should exclude as it pertains to past events of a Man’s Life Journey? In a short span in Army, you encountered a “REAL SPECIES” un-fortunately a “SIX THOUSAND”. Thanks for your kind comment. During 1971 War, as we marched on foot, I had seen a soldier marching ahead of me blown away and his stomach got ripped open and his intestines spilled out. I would not mind getting killed in that manner. You have correctly pointed out that a “Six Thousand” on the verge of retirement should not have displayed that type of vengeance. I would have appreciated if he did not lie about it. He was the top Boss. I cannot understand as to why he should lie about his actions? I had encountered all types of dangers to my physical life and every time I escaped without a scratch. I remember this Story to remember all the Officers who stood by me and had directly opposed the authority of his Office. 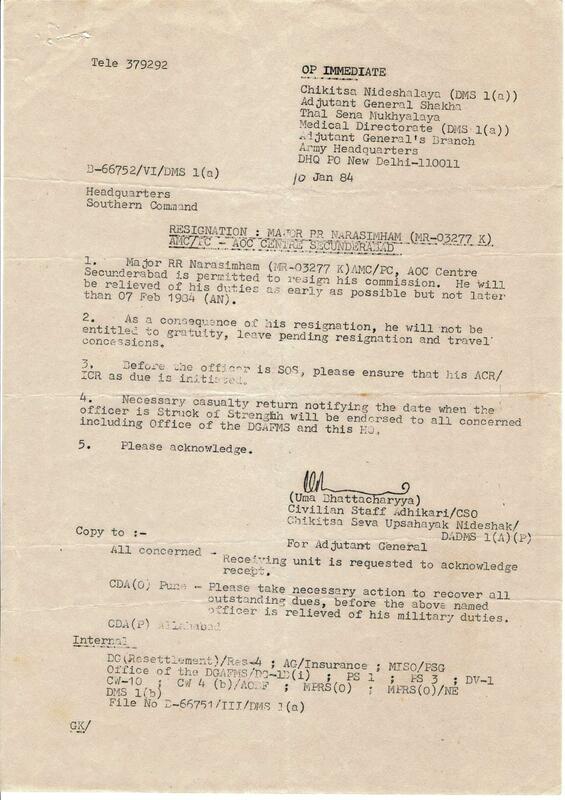 My transfer orders(SECOND) issued in October 1982 was never cancelled and my Unit refused to issue me a Movement Order and there was no breach of Discipline on that account. i read most of your postings in Bhavan Jagat and i admire your command of English, meticulous documentation of events in your life and our country,but cannot understand your obsession with [from the picture portrayed by you]this ‘rao’ who played an insignificant role in your life.And for all i know he may not be alive now.For his actions and your reactions,the only explanation i can find is in the geetacharyas dictum”Buddhi Karmanusari”.your birth,education,army service,resignation,migration to America, are all part of your karma;and kartavyam is Daivanirnayam. Let not bhavan Jagat be soiled by the name of this rao anymore. Namaskarams. Thanks for your kind comments. I had all these papers with me all these years and I had never shared them with others. I still hold Bammera Potana as my mentor and I told this Story now as my children never knew as to what had happened in India and as to why I had to leave the country. They are now grown up and they should be prepared to face the realities of life. Even my brothers and father had never understood this part of the story. None of them had ever seen the Testimonials that I had received from a Lieutenant General, four Brigadiers, one Colonel, and one Lieutenant Colonel. These Officers were all in Service at that time. I did not disclose to my father and brothers the problems created by General Rao. I was in Secunderabad and only Pedda nannagaru was aware of these issues but he too had not seen the Testimonials I had received. General Pratap Rao while he was in the rank of a Brigadier came to Rajahmundry to meet my father and he spoke to my father at Rajahmundry Railway Station as I was waiting there to catch a train to return to Ambala at the end of my leave. My wife, and my little daughter were also with me. He had noticed me and never had bothered to say a word to me. I was serving as a Major in Army Medical Corps and I was not a beggar on the platform. I want to know as to how I had harmed him? If he had acted in the interests of Army Service, I would have glorified him. I had openly called him a Liar and exposed his lack of Courage. If I had not seen him visiting my father in Rajahmundry, I would have forgotten this Story. That was the only time I saw him in my entire life while I served in Indian Army. He came to Secunderabad and I had avoided him as he had already harmed me in several ways. God gave me that opportunity to see with my own eyes as to who would harm me in my life and career and at the same time God had uplifted me from that situation which would be hurtful. I take full Pride in the fact that my Unit had never ordered me to proceed on that Transfer to Mizo Hills and that is how God has shown His Mercy and Grace. I accept your views and have now corrected my story. 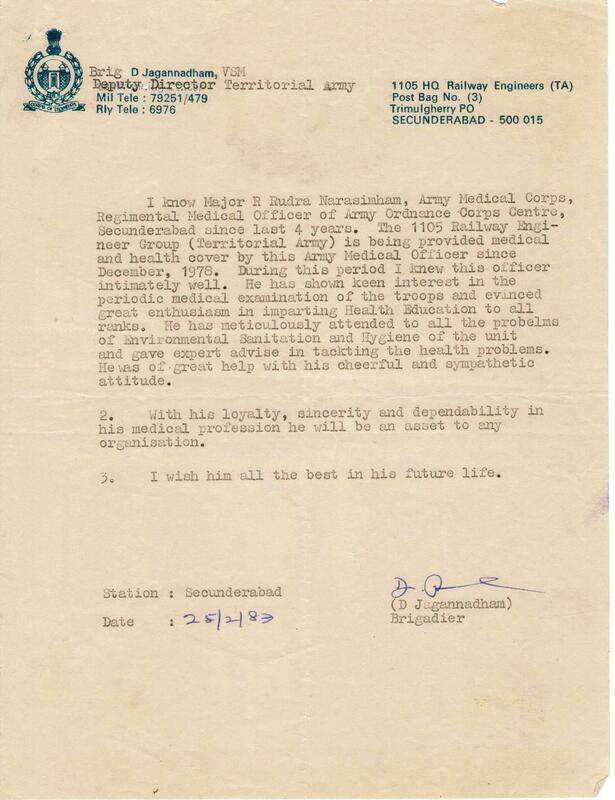 My Resignation from Service had forced the DGAFMS to change the official policy of Indian Army Medical Corps. The Policy instituted by General Rao did not permit AMC Medical officers to apply for Study Leave/Specialist Training if they had completed Ten Years of Service. That Policy was unjust and unfair. I had protested that Policy and had resigned as a matter of Principle. I won that Battle. Ministry of Defence has supported my view and had directed the DGAFMS to change that Policy. I could not celebrate my Victory. General Rao kept it as a secret. Just before I had left Secundrebad, I was informed that the new DGAFMS had issued orders changing the Policy about Study Leave/Specialist Training. I could not Reap the Fruits of my efforts. Today, AMC Doctors can seek Study Leave/Specialist Training even if they have completed Ten Years of Service. 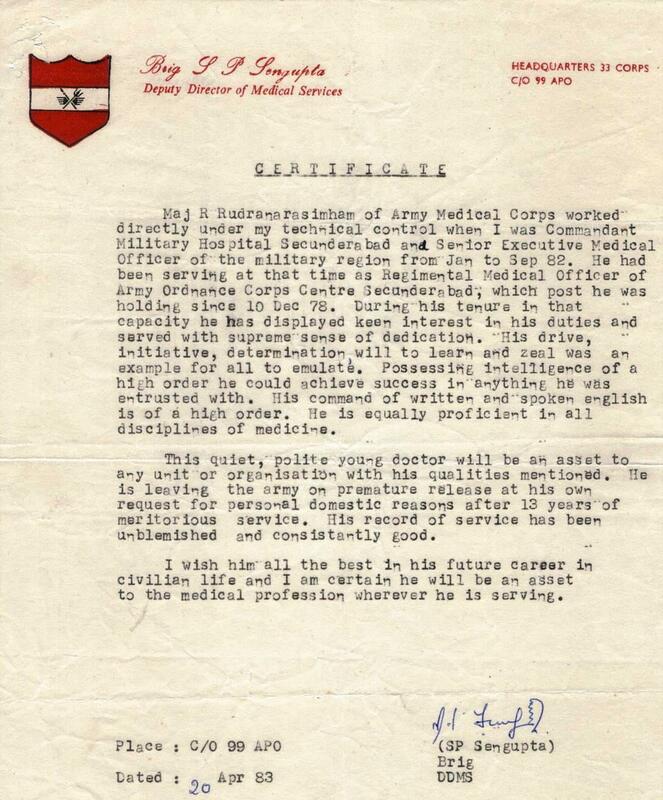 I will claim Credit for changing AMC Policy about Training Army Doctors. Thanks for reading this story. I fully agree with your views and comments. I had changed the title of this post. I have now added the words “Laws of Karma”. While I was desiring to improve my education, status, and position, God has wanted to train me in The Laws of Karma. God gives me success and I acknowledge my existence in the physical word as an act of Divine Mercy, Grace, and Compassion. But, God would not let me seek the Fruits of my actions. I was recommended for a Gallantry Award. It was not in God’s Plan. I got the DGAFMS Silver Medal and yet could not qualify for Specialist Training in a minor field of study like Paediatrics. During August 1983, I won this major Battle and got AMC Policy changed and God would not let me claim the Fruits of my action. If I had known that the Policy would be changed, I would not have pressed about my Resignation. I would have gone to Mizo Hills and would have reapplied for Study Leave or Advanced Specialist Training. God would not let me go that way. I do not live in pain. God is training me and He is my Instructor. I have no choice. I often wonder as to why God has chosen me as His pupil. I have enough intelligence to be successful in my life. God wants to direct me away from aspiring such success and recognition. I have to live and act without any desire for the Fruits of my actions. Thanks for viewing this post and I sincerely appreciate your kind suggestion about posting classified information on Internet. As a Doctor of Medicine, I have treated two types of injuries. 1.Physical wounds and injuries: These wounds are carefully closed and covered with dressings and bandages and it helps the natural wound healing process. 2. Mental injuries, Psychological trauma, emotional pain, and mental grief : This kind of damage should not be concealed or covered up. The mental wounds must be fully exposed and then only the natural healing process begins. Grief begins the healing mechanisms only when it is expressed openly. Very often, there is no person available to listen or know your mental pain. Even then, the injured person must submit his pain to God and ask for divine healing. The documents that I had shared on Internet are not fake or fabricated documents. I am exposing my pain with the help of these pieces of paper. If I am wrong in doing so, I am willing to face further action from the Government of India. To punish me, I must be tried in a Court of Law. To my Judge, and to my God, I will tell my story and tell them that I was hurt for no apparent fault of mine. The only mistake that I have done in my Army Life was that I had married a woman who does not belong to my caste or religion. 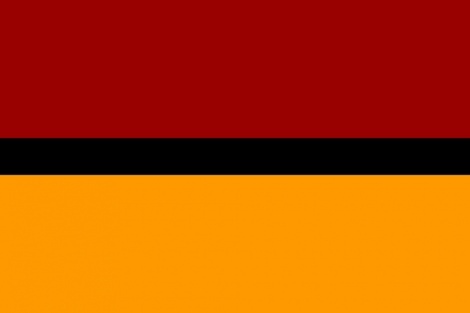 I am born Hindu and I belong to the Brahmin caste. I had married a Protestant Christian woman. For this offence of interfaith or intercaste marriage, I was punished twice during my Indian Army Service. I was kicked out of Armed Forces Medical College, Pune and was openly humiliated. The person who had punished me during 1976 was the Commandant of the Armed Forces Medical College, Pune and he belonged to my South Indian Brahmin community and knew me even before I had joined Indian Army. During 1982-83, the Director General of Armed Forces of Medical Services, the top boss of the Indian Army Medical Corps had tried his best to add insult to my humiliation. He also belonged to my South Indian Brahmin community. I had joined Indian Army at a very young age just after finishing my Medical School. I had joined to serve the Nation with Pride, Dignity, and Honor. I am willing to face death at the hands of my enemy while defending my country. However, I am not willing to be insulted and humiliated by members of my own caste and community for I had married violating the caste tradition. I want to fully expose this illegal harassment at my workplace. If I had worked for a private company, I could have sued the boss and the company for wrongdoing. In Army Service, it is very difficult to ask for justice. In any case, I must seek healing of my wounds and the right thing to do is to expose the wounds to all people to see and then I hope to receive God’s Compassion, Mercy, and Grace. General Rao’s sister’s advice is appropriate By dealing with the rough lemons we have faced in our lives in spite of our ram rod honesty, the best policy is to forget if not forgive. I am reminded of Dr.Atluri Palayya, not a medical doctor, but a PH.D. in Engineering, who was hounded by one Mr.Vepa v.L. RAo in Warangal REgional Engineering College.Dr Palayya taught me material testing in Kakinada in 1949.He,had to commit atma hatya unable to face the malicious VVL Rao. Being a non medical man I cannot make out muchJust a few days back I met a full Hony Colonel of the AMC who told me as much as you have revealed. He had served in Dras far more dangerous than Kargil. Thanks for visiting the blog post and sharing your very kind view. This story that you read, I have shared it a long time after I left India. I have not returned to India since 1984. After His Holiness the 14th Dalai Lama’s visit to Ann Arbor, I recognized the existence of the Living Tibetan Spirits in my consciousness, and I had to review my past service in Indian Army, and have taken up the challenge of an unfinished task.